Central venous catheters (CVCs) are commonly used in emergency medicine for various indications, including administration of vasopressors in hypotension refractory to intravascular fluid repletion, monitoring of central venous pressure (CVP), as well as rapid delivery of large volume resuscitation fluids in the case of the Cordis. There are three sites commonly used for the placement of CVCs – internal jugular, subclavian and femoral veins. Known complications of this procedure include infection, thrombosis and complications related to instrumentation, such as iatrogenic pneumothorax or arterial injury. The former two complications were the object of study of the 3SITES study, in which the authors set out to demonstrate whether or not the risk of complication was higher with CVC placement at one site versus the others. Parienti JJ, Mongardon N, et al. Intravascular complications of central venous catheterization by insertion site. The New England Journal of Medicine. 2015;373(13): 1220-9. The study design was a multi-center randomized, controlled trial that was conducted in ten ICU’s at nine hospitals throughout France. All the CVCs were placed under strict sterile conditions, including appropriate personal protective gear and draping. Both French and U.S. guidelines were adhered to in an attempt to maintain maximum sterility and safety while placing the CVCs. The Seldinger technique was used for all CVC placement, with landmark technique or ultrasound being used to locate the proper vessel. Once placed, the CVC’s were not used for phlebotomy or for renal replacement therapy. Upon catheter removal, the tip was sent for culture and simultaneous peripheral blood was cultured to assess for central-line associated blood stream infection (CLABSI). Also, within two days of CVC removal, ultrasound was performed of the catheterization site to assess for a deep vein thrombosis (DVT) at that site, regardless of whether or not the patient was symptomatic. There were two major complications that defined the primary outcomes of this study. Those were catheter-related bloodstream infection and symptomatic DVT. To diagnose a catheter-related bloodstream infection, the catheter tip had to be infected with a bacterial species that was also isolated from the peripheral blood culture. Symptomatic DVT was assessed with compression ultrasonography. Secondary outcomes measures included time to infection, time to development of DVT after catheter removal, and development of mechanical complications from CVC insertion, such as pneumothorax. The primary conclusion of this article is that use of the subclavian vein for CVC placement led to reduced infections as well as fewer symptomatic DVTs. However, there were more mechanical complications (i.e. iatrogenic pneumothoraces) seen with use of the subclavian vein than with the other sites. As mentioned in the article, one of the reasons that there may be fewer infections is due to the fact that the subcutaneous course to access the subclavian vein is longer than with the other sites and the subclavian site is less likely to be disrupted during use, leading to potentially less introduction of bacteria to the site. When all total infectious, mechanical and thrombotic complications are considered, all three sites are about equal. In addition, there have been numerous other studies that have focused on the complications of central lines, some of which have similar findings to this study and others that have findings that differ slightly. One such study by Deshpande et al. looked at the infectious complications associated with all three commonly used CVC insertion sites and found that when proper technique and catheter care is used, the rates of infection are very low across all three sites and we not statistically significant . A meta-analysis by Akhter, et al. had similar results, demonstrating that all CVCs regardless of site have similar rates of infection, with the caveat that femoral lines had a higher incidence of infection and thrombosis in the short term when compared to internal jugular lines . Another aspect of CVC insertion is the use of ultrasonography to assist with proper placement. Multiple studies have been conducted over the past decade that have supported the use ultrasound to more efficiently and accurately place CVCs. One such study showed that the use of real-time ultrasonography when placing a CVC was associated with significantly lower rates of complications as well as higher rates of success when compared to placement by landmark technique alone . Today, the use of ultrasound has become the gold standard for the placement of CVCs, as the medical community has moved away from a strictly landmark approach as was standard before the advent of ultrasound. In summary, the topic paper as well as other supporting literature all suggest that the placement of CVCs, when done by skilled practitioners under sterile technique with proper ultrasound utilization and catheter care have low rates of infection, thrombosis and mechanical complications. However, there is still slight variation of the rates of these complications between the three primary sites as previously discussed. Central venous catheters are commonly used in emergency medicine for various indications, but are associated with known complications. The primary complications of CVC use are infection, thrombosis at the site of insertion, and mechanical complications such as pneumothorax. 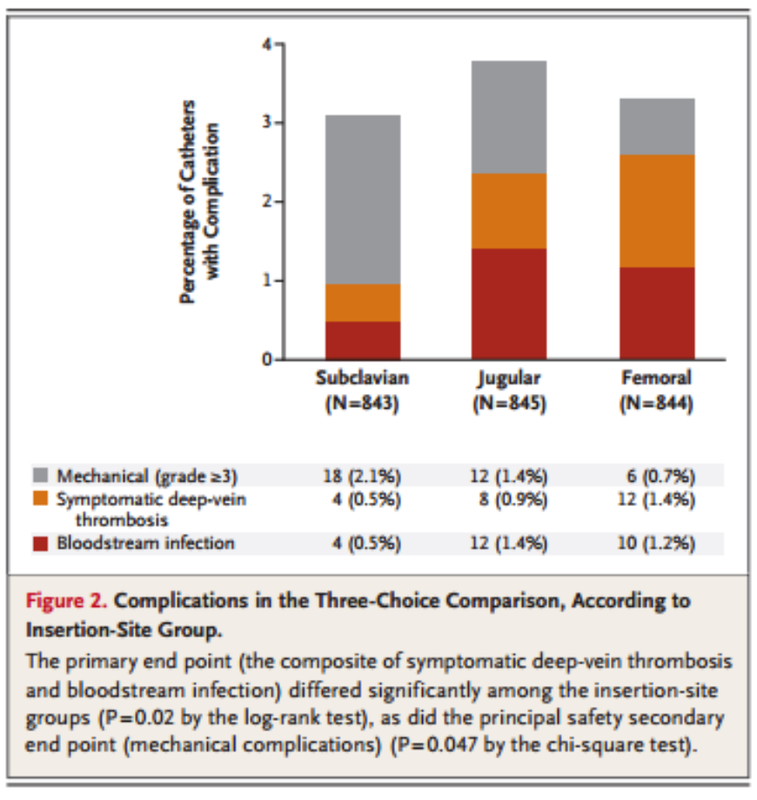 Subclavian CVC placement is associated with fewer infectious and thrombosis complications than femoral and internal jugular site use. However, subclavian vein CVC placement are associated with more mechanical complications than the other sites. When all complications are compiled, the three sites have similar rates of complication, and future studies can be conducted to determine how ultrasound use in subclavian line placement can potentially decrease mechanical complications. This joins a growing body of literature on complications associated with each central access site. There are several things about this study that I think are commendable. This is a very large population of patients, certainly the largest to date in an RCT like this. The only other RCT I am aware of comparing central line complications by site was in JAMA in 2001 and included 289 patients . The authors ensured that the lines were placed (or at least supervised) by experienced operators (>50 line placements). The use of a composite endpoint here (“major catheter-related complications”) lends strength to the study in that gives us more ability to compare lines head to head. There is a growing body of data showing that all 3 sites probably have similar rates of infection [3,6] so it is very reasonable to consider complications more broadly. Can we compare an ICU study to our ED experience? The answer is almost certainly “yes.” Although I do not have statistics on this, the majority of academic emergency departments seem to be using full sterile technique to place central lines. There is evidence that at least the infectious complications of ED placed catheters are no higher than those in ICUs . I read this paper as something of a cautious victory for the often-neglected subclavian site. In the age of ultrasound guided IJ, which has certainly been shown to have advantages [4,8], the SC line seems to be a bit of a dying art. The authors comment that the SC site has the longest subcutaneous course, the lowest bio-burden, and is the easiest site on which to maintain a good dressing. I would add that for both insertion and maintenance the SC is in my experience by far the most comfortable site for patients. It is a line that can be placed rapidly and safely without the need for ultrasound. In this study the SC did have the highest rate of insertion complications, primarily pneumothorax. While not wanting to sound dismissive of the inconvenience to a patient of a collapsed lung, I sometimes pose the question to residents, “would you rather have a small line associated PTX, a DVT, or a CLABSI?” If we understand central line complications as broader than just a question of “did I drop the lung or hit the artery?” we can make more patient-centered decisions about these complex cases. The body of literature on comparing sites for central access should lead us to conclude that there are not inherently “better” or “worse” sites (pace the recommendation of the CDC ). As we increase our focus on providing high quality ED care to critically ill patients we should recognize that any site for central access is acceptable as long as proper technique is maintained. Deshpande KS, et al. The incidence of infectious complications of central venous catheters at the subclavian, internal jugular, and femoral sites in an intensive care unit population. Critical Care Medicine. 2005;33(1): 13-20. Akhter M, Runde D, Lee J. Which central line insertion site is the least prone to infection? Annals of Emergency Medicine. 2012;61(3): 362-3. Leung J, Duffy M, Finckh A. Real-time ultrasonographically-guided internal jugular vein catheterization in the emergency department increases success rates and reduces complications: a randomized, prospective study. Annals of Emergency Medicine. 2006;48(5): 540-7. Merrer, J., et al., Complications of femoral and subclavian venous catheterization in critically ill patients: a randomized controlled trial. JAMA, 2001. 286(6): p. 700-7. Ge, X., et al., Central venous access sites for the prevention of venous thrombosis, stenosis and infection. Cochrane Database Syst Rev, 2012. 3: p. CD004084. LeMaster, C.H., et al., Infection and natural history of emergency department-placed central venous catheters. Ann Emerg Med, 2010. 56(5): p. 492-7. Hind, D., et al., Ultrasonic locating devices for central venous cannulation: meta-analysis. BMJ, 2003. 327(7411): p. 361. O'Grady, N.P., et al., Guidelines for the prevention of intravascular catheter-related infections. Am J Infect Control, 2011. 39(4 Suppl 1): p. S1-34.